As a new researcher in the area of minimally disruptive medicine, I have started to think quite a bit about what fit and minimally disruptive medicine really are. 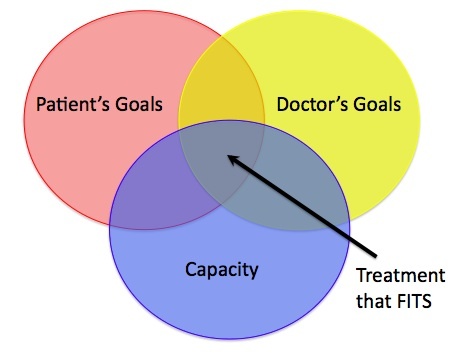 I have come to a (relatively) simple definition: fit is patients and doctors working and making decisions together to develop a treatment plan that meets the patient and doctor’s goal for managing disease while still being manageable for the patient. The single most important reason why it is important for a treatment to fit is that patients have the single largest stake in the treatment. It is the patient who will have to schedule the visits, take the medication, monitor his or her health, adjust his or her lifestyle, and deal with the effects of either the disease, the treatment, or both. These burdens of disease and burden of treatment must be managed using the resources of the patient and often his or her social community. The patient must have the capacity to cope with the demands of a treatment regimen in order for the treatment to help achieve a health goal. A good treatment fit with minimized treatment (and disease) burden are especially important for patients with at least one chronic disease, as the patient’s commitment to treatment can last a lifetime and the cumulative burden of disease and treatment can become very large. The problem with many prescribed treatments is that the treatment must be used as directed in order to achieve the desired health outcome. Patient adherence, therefore, can be a major determining factor in whether a treatment will be able to achieve the doctor and patient’s goal. In addition to the decrease in benefit from treatment when adherence is low, additional side effects, complications, and doctor visits can result. Such consequences, which can result when disease management is poor, create an additional burden of disease and/or treatment for the patient, the community, and for society. Since adherence to treatments and the ability to cope with treatment burden can have a large effect on treatment outcomes, prescribed treatments should be chosen to fit a patient and to be minimally disruptive (or minimally burdensome) in order to allow for the best chance of reaching a health goal. For a visual image of the way that I picture fit and minimally disruptive medicine, picture Venn diagram of three overlapping circles. Each circle represents an important factor in choosing and implementing a treatment: on circle is the domain of the patient’s goals, on circle is the domain of the doctor’s goals, and one circle is the capacity of the patient to cope with or adhere to a treatment. At the intersection of all three domains is treatment that fits, and the practice of minimally disruptive medicine. In a perfect world, the doctor and patient would agree on all goals for treatment and disease management, and all of the possible treatments that would accomplish this goal would be within the capacity of the patient. In the real world, we must use different tools and ways of practicing medicine to determine the shared goal with as much agreement as possible between doctor and patient, and to find treatments that are within the capacity of the patient and can be accomplished using the patient’s available resources. This would mean working in the “zone” of treatment fit and minimally disruptive medicine, and allow the greatest chance of successfully achieving health goals. Many different interventions have been developed which aim at improving health with the primary goal of increasing patient adherence and thus the efficacy of available treatment options. While many practices, including evidence-based and patient-centered medicine, include the aim to bring the doctor and patient to an agreed upon and effective treatment, specific tools have been developed to aid in setting these goals and prioritizing the characteristics of available treatments for the patient. These attributes include the efficacy of the treatment, various burdens of administration or monitoring of the treatment, side effects, cost in time, money, and resources, and access. Tools for helping to fit a treatment include decision aides, which give doctor and patient and systematic and inclusive approach. Countless other interventions to improve treatment adherence address the issue of capacity by either increasing the patient’s resources available to use toward treatment (i.e. providing childcare, accompaniment to appointments, transportation, reminders) or by decreasing the burden of treatment to adjust for the patient’s capacity (i.e. scheduling fewer appointments, reducing costs, etc.) In some cases, treatment or outcome goals are adjusted so that the treatment necessary to accomplish them is within the capacity of the patient. Decisions to modify treatment or outcome goals must also take into account the possibility that while treatment burden may decrease as a result, the burden of disease increase in the short- or long-term as a result. The practice and pursuit of finding a treatment that fits by shifting the doctor and patient goals as well as by addressing the patient’s capacity to cope with or adhere to a treatment is the practice of minimally disruptive medicine. In minimally disruptive medicine, the most important objective should be to treat or manage disease so that the patient has the best chance of leading the life that he or she wants with minimal disruption due to disease or treatment. I recently began the long journey of medical school because I want to spend my life helping others to address health problems in order to use time an energy towards other priorities, and in minimally disruptive medicine, I hope to find a fit. Really interesting and informative post Hannah. I wonder how you’re looking at achieving the pragmatic “minimally disruptive” approach to medicine you describe? I’m looking at how to achieve the same thing and think that a better understanding of complexity science and how it applies to medicine could help us. My own blog is at http://medicalcomplexity.com. fantastic essay – i’d like to use the diagram – please – in a lecture I am giving in Norway soon – I will attribute you of course – and would love to see you link this to shared decision making… maybe this might be possible with Victor as a bridge? Absolutely, you are welcome to use it! I will do some reading and thinking about shared decision making, and hopefully be able to post again soon! I would have a suggestion about how to develop the Venn diagram by the way – as I’m not sure the patient capacity is the issue here. Wennberg would argue that its the supply side that influences what is ‘done’ – the more supply in the system – the more gets done to patients by medicine…. Although I think that supply does play an important role in health as it is related to the patient’s access to health care services, I’m taking more of a patient-centered view of health care than one that is centered on the characteristics of the system. Low adherence to treatments and the subsequent less optimal health outcomes are observed across health care systems, especially in chronic diseases. Regardless of access to health care, most care regimens (apart from hospital or facility-based care and DOT programs) rely heavily on patient commitment and participation to deliver treatment. The important factor that needs to be considered here is not so much what gets done “to patients by medicine”, but what gets done to patients by patients. With this in mind, each person has an ability to take on up to a certain amount of participation in their own health care delivery, by devoting psychological, monetary, time and other resources to health-related activites. Often, when the demand on one or more of these resources is exceeded, a patient’s ability to follow medical advice (and by doing so reach health goals) is compromised. In examining this capacity, we are recognizing the fact treatment creates a burden on patients separate from the burden of disease, and that both must be managed successfully in order to achieve the best possible treatment and health. Very interesting post. I’m just becoming familiar with Minimally Disruptive Medicine. I like the idea about a partnership between the provider and the patient. There is a range here – of course – among patients that are really involved and confident in making their own decicions and those that really want the doctor to tell them what to do. The diagram brought into focus, for me, that true Shared Decision Making will leverage the provider’s expertise which is a good thing, in my opinion. last week our class held a similar discussion about this subject and you illustrate something we haven’t covered yet, appreciate that.